Toronto was once a city that turned its back on the past. From the 1950s to the 1980s, countless historical structures were demolished to make way for things like parking lots and anonymous office structures. Fortunately, that time has past. Not only are developers forced to imagine new uses for heritage-designated structures, but many of them do so willingly with stunning results. Here are my picks for the top heritage conversions in Toronto. Toronto's propensity to demolish historical buildings in the 1960s and '70s has thankfully tapered; otherwise we might not have something like One King West. Formerly home to the Dominion Bank (1914), the new condo and hotel rises above the existing heritage structure, which still serves as the venue for private dining function in the former vault and grand banking hall. 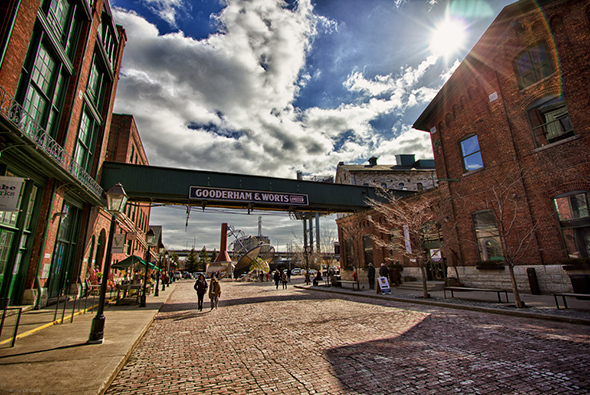 Throughout the 1990s, what's now called the Distillery District was completely abandoned and used only sparingly for movie shoots and as a playground for urban explorers. When it reopened in 2003, developer Cityscape's refusal to lease space to chain franchises ensured it was a vibrant area for independent cafes and galleries. Artscape's presence was also a boon. 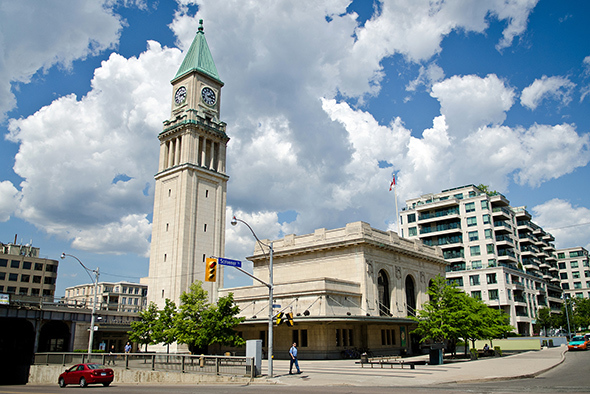 One of heritage enthusiast Paul Oberman's legacies, the redevelopment of the North Toronto Railway Station into the LCBO's flagship location turned a disused space into one of the nicest retail environments in the city. The soaring ceiling in what used to be the main waiting area is as dramatic as the Bordeaux selection. 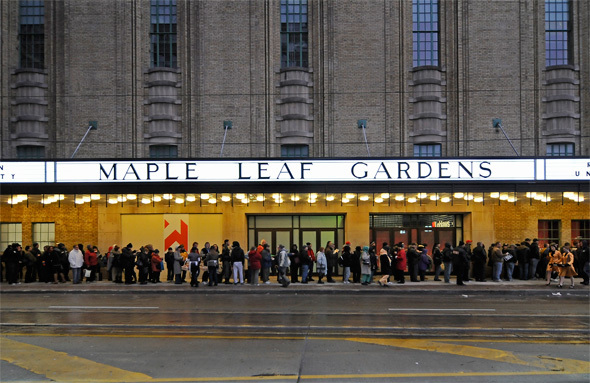 While there was once hope that Maple Leaf Gardens could be retained as a sports venue, in retrospect that really was a pipe dream. Not everyone loves the idea of a Loblaws in this historic structure, but it's great to see so much activity in the old barn. Better still is the presence of the Ryerson rink at the Mattamy Athletic Centre. You can still skate under the imposing cathedral ceiling. 401 Richmond is a place that exemplifies Jane Jacobs' dictum that "new ideas must use old buildings." Purchased by the Zeidler family in 1994 (and thereby saved from the wrecking ball), the building has served as an arts and culture hub for over 20 years now. 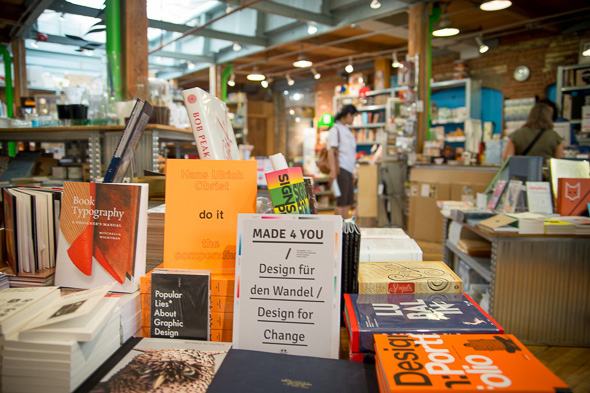 The recent edition of the Spacing Store is pitch perfect. 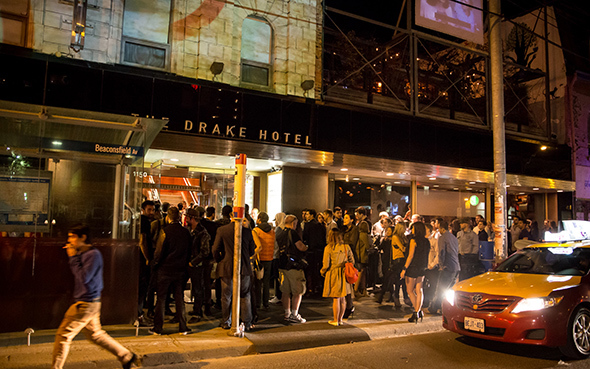 I lump these two projects together because collectively they shifted the state of West Queen West from a rough-around-the-edges formerly industrial neighbourhood at the outset of the 2000s into one of the reputedly hippest stretches of in the world. Kudos again to the Zeidler family (Gladstone) and Jeff Stober (Drake). There were originally two "roundhouses" in Toronto's Railway Lands, one of which was demolished to make way for the SkyDome (now the Rogers Centre). 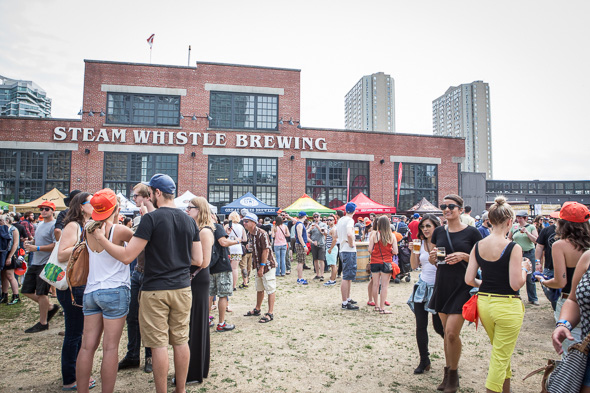 Fortunately, the former John Street Roundhouse was taken over by Steam Whistle in the early 2000s and now serves as one of the city's most important craft breweries and a key event space. 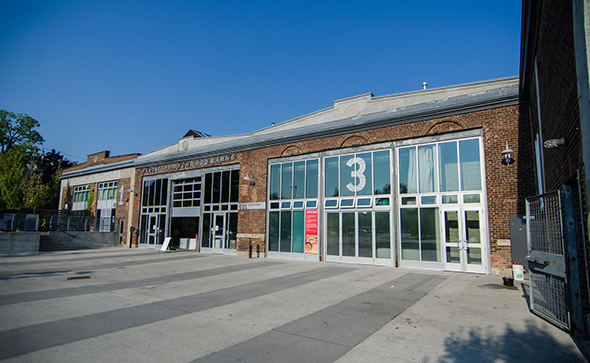 My favourite Artscape project to date, the old streetcar storage and maintenance facility just off St. Clair West originally opened in 1913 and was converted to artist live-work spaces and a community hub in 2008. When the farmers' market is in full swing, the place is alive with energy in a way that all old buildings deserve. 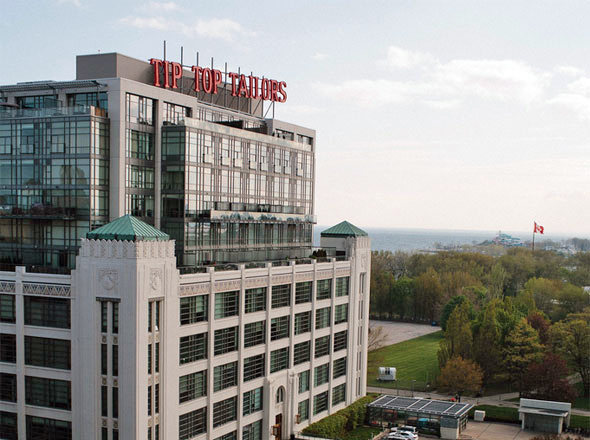 The Tip Top Lofts manage to achieve something that very few residential adaptive re-uses of former industrial buildings do -- it looks better now than it ever did. Re-vamped by architectsAlliance in 2002, the building witnessed the addition of six storeys, but the old Art Deco structure retains all of its charm, thanks in no small part to the retention and raising of the glorious original neon sign. 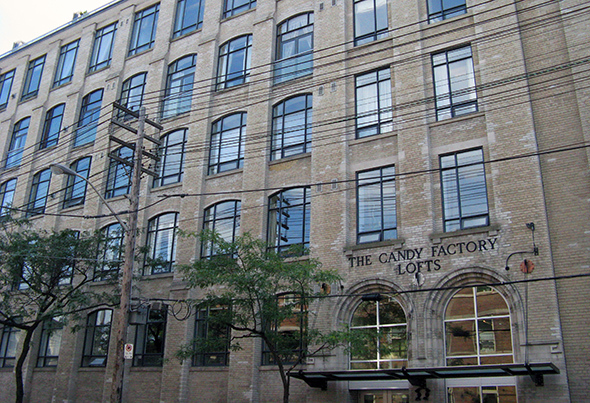 The Candy Factory Lofts might not be astounding to look at from the outside - reminiscent of Maple Leaf Gardens but without the wonderful marquee and storied sporting history - but you'd be hard-pressed to find a better example of hard loft conversions in Toronto. The ample wood beams and obvious industrial character of the building have been preserved most attentively. What did I miss? Add your suggestions in the comments. Photos by Peter Francis, Carlos Bolivar, Sean Go, Derek Flack, Jesse Milns (x3), Jeff Hitchcock, Christina Gable, and Andrea Hughes.